A Month in the Country (Russian: Месяц в деревне, translit. Mesiats v derevne) is a play in five acts by Ivan Turgenev, his only well-known work for the theatre. Originally titled The Student, it was written in France between 1848 and 1850 and first published in 1855 as Two Women. The play was not staged until 1872, when it was given as A Month in the Country at a benefit performance for the Moscow actress Ekaterina Vasilyeva (1829–1877), who was keen to play the leading role of Natalya Petrovna. the Moscow Art Theatre's production in 1909. Originally entitled The Student, the play was banned by the Saint Petersburg censor without being performed. Turgenev changed the title to Two Women. In 1854 it was passed for publication, provided alterations were made — demands made more on moral than political grounds. To play down the controversy, Turgenev finally settled on the name A Month in the Country. Turgenev's comedy has often been called Chekhovian, even though it preceded Chekhov's mature work by more than forty years. 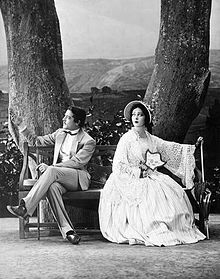 The happiest irony surrounding the play's survival is that its ultimate success was due more than anything to the popularity of Chekhov's work and the kind of ensemble playing which Stanislavsky [sic] fostered at the Moscow Art Theatre. It was his production in 1909, when he played the role of Rakitin, that finally demonstrated the true brilliance of Turgenev's long-neglected play. The setting is the Islaev country estate in the 1840s. Natalya Petrovna, a headstrong 29-year-old, is married to Arkadi Islaev, a rich landowner seven years her senior. Bored with life, she welcomes the attentions of Mikhail Rakitin as her devoted but resentful admirer, without ever letting their friendship develop into a love affair. The arrival of the handsome 21-year-old student Aleksei Belyaev as tutor to her son Kolya ends her boredom. Natalya falls in love with Aleksei, but so does her ward Vera, the Islaevs' 17-year-old foster daughter. To rid herself of her rival, Natalya proposes that Vera should marry a rich old neighbour, but the rivalry remains unresolved. Rakitin struggles with his love for Natalya, and she wrestles with hers for Aleksei, while Vera and Aleksei draw closer. Misunderstandings arise, and when Arkadi begins to have his suspicions, both Rakitin and Aleksei are obliged to leave. As other members of the household drift off to their own worlds, Natalya's life returns to a state of boredom. Islayev (Nikolai Massalitinov, left) and his mother Anna (Maria Samarova) surprise his wife Natalya (Olga Knipper, centre) and her would-be lover and friend of the family Rakitin (Konstantin Stanislavski), in Act 3 of the MAT production (1909). After its 1872 premiere, A Month in the Country was not performed again until 1879, when it became a regular part of the Russian repertoire. The Moscow Art Theatre (MAT) production opened on 22 December [O.S. 9 December] 1909. It was directed by Konstantin Stanislavski (who alternated the role of Rakitin with Vasili Kachalov) and Ivan Moskvin. Olga Knipper played Natalya, Nikolai Massalitinov was her husband, Islayev, and Maria Samarova his mother, Anna. Richard Boleslavsky played Belyaev, with Lydia Koreneva as Verochka. The rest of the cast included Elena Muratova as Lizaveta, Nikolai Zvantsev as Schaaf, Ilya Uralov as Bolshintsov, Vladimir Gribunin as Shpigelsky, I. V. Lazarev as Matvei, and Lyubov Dmitrevskaya as Katya. Scenic design was by the World of Art artist Mstislav Dobuzhinsky. This was the first production in which Stanislavski made use of his emerging 'system' of acting, much to the general distress of the actors, and Knipper in particular. Albery Theatre London, November 1975, by the Prospect Theatre Company, directed by Toby Robertson, starring Dorothy Tutin, Derek Jacobi and Gary Russell. Turgenev's play was freely adapted by choreographer Frederick Ashton as a one-act ballet of the same name for the Royal Ballet company in 1976. John Lanchbery arranged the score based on music by Frédéric Chopin; the stage design was by Julia Trevelyan Oman. Natalia was first danced by Lynn Seymour, for whom the role was created, and Anthony Dowell danced the role of Belyaev. For research purposes, Frederick Ashton took Lynn Seymour and the rest of the ballet cast to see the London production of the play, with Dorothy Tutin in the lead. The premiere ballet performance was presented at the Royal Opera House, Covent Garden, on 12 February 1976, and the production was filmed that year by director Colin Nears for the BBC. Lynn Seymour also danced the role in New York. Lee Hoiby composed a two-act opera based on the play. Originally titled Natalia Petrovna, it was premiered in 1964 at New York City Opera. It was revised as A Month in the Country; this form was premiered in Boston in 1981, and has since been recorded. ^ According to Richard Freeborn, in: Turgenev, Ivan. A Month in the Country, Oxford World's Classics (1991), Introduction, p. x. ^ Turgenev, Ivan (1980). A Month in the Country - Issue 2 of Monash Nineteenth-century drama series. Dramatists Play Service Inc. p. 7. ISBN 9780822207726. ^ Cf. John Thaxter's review in Richmond and Twickenham Times, 25 February 1994. ^ This made-for-television film was filmed in 1967 (Penman, Margaret; Toronto Telegram News Service. "Toronto's Gift to 'The Avengers'" Ottawa Journal. February 10, 1968, p. 56. Also: Cheshire, Ellen. "A King Among Queens". 1 June 2015. ), but IMDB lists the first air date as 1977. Benedetti, Jean. 1999. Stanislavski: His Life and Art. Revised edition. Original edition published in 1988. London: Methuen. ISBN 0-413-52520-1. Berlin, Isaiah, trans. 1981. A Month in the Country. By Ivan Turgenev. London: Penguin. ISBN 0-14-044436-X. Kavanagh, Julie. 1996. Secret Muses: The Life of Frederick Ashton. London: Faber. ISBN 0-571-14352-0. Patterson, Michael, ed. 2005. The Oxford Dictionary of Plays. Oxford: Oxford UP. ISBN 0-19-860417-3. Tanitch, Robert. 2007. London Stage in the 20th Century London: Haus. ISBN 978-1-904950-74-5. Theatre Record and its annual Indexes. Worrall, Nick. 1996. The Moscow Art Theatre. Theatre Production Studies ser. London and NY: Routledge. ISBN 0-415-05598-9. Wikimedia Commons has media related to A Month in the Country (play).